Did You Have Wet Patches on Your Ceiling This Winter? Did winter leave you with wet patches on your ceiling? Or did you end up having to invest in buckets to catch the drips? A leaking roof is a costly and inconvenient disaster waiting to happen, so now the wet weather has dried up, it’s time to call ROOFWEST, the roof restoration and repair specialists. Whether your roof be made of tin or tile, the team at ROOFWEST are experts in repairing damage caused by weather, vandals, falling trees or general ageing, offering you cost effective, efficient service and a result you will sure to be please with. A leaking roof does not just cause a wet patch that you can see forming on your ceiling inside your home. Water pooling in the roof cavity will cause insulation damage and deterioration, mould growing in the roof space and sagging of the ceiling materials. Over time, this sagging will eventually give way to a very large downpour into your home, resulting in water damage to furniture, appliances and floor coverings. This water is not fresh from the sky either and this stagnant, smelly liquid will be extremely inconvenient and costly to clean up. Water and electrics definitely don’t mix either. With all insurance policies, you will find that it stipulates; as soon as damage is detected it must be repaired by a licensed tradesman as soon as possible to avoid further damage. 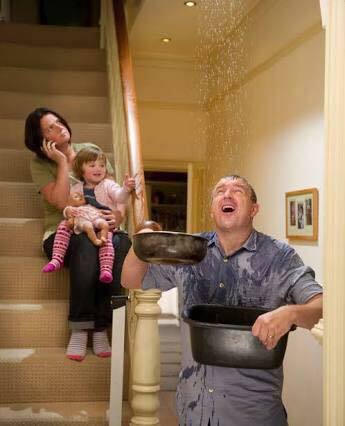 If roof leaks are left too long and cause further destruction to other areas of the home, your insurance company can argue that you have not rectified it promptly and may not pay out on your home policy to get it repaired. Cracked tiles are doorways for burglars and open tin is easy for rodents and animals to climb into your roof cavity. Keep your home and roof space free from extra visitors and security threats and call ROOFWEST in to inspect your roof covering. ROOFWEST not only repair roof surfaces, but can restore old tiles, high pressure clean your dirty tin, inspect guttering and seal your roof with their fully adhered, liquid membrane designed to breathe new life into your roof and protect it from the elements. Did Your Roof Leak in Winter? Fix It Now! The team at ROOFWEST can assist with all of your roof repair needs, and inspect your roof for any other damage that may cause problems in the future. For a free inspection and no-obligation quote, call Tom on 9795 9990 today. Who Can Fix My Roof In Brunswick? How Long Do Roof Coatings Last?